2017… what a year! From artificial intelligence to automation, open banking and fintech partnerships to big data, there was certainly no shortage of excitement and things to talk about in the digital banking world this year. Let’s not forget about growing cybersecurity concerns and the ever-present challenge of keeping up with compliance regulations. With so much going on, it can be difficult to keep up. Not to worry, our team wrote about many of the trends and topics you were talking about in our Q2 Blog. In January of 2017, we announced Q2 SMART, our groundbreaking data analytics platform to help financial institutions uncover and target the real needs of customers. Adam Blue, our Chief Technology Officer, spoke about his team’s journey and how the platform can reveal unprecedented opportunities for banks and credit unions. The “Netflix” model can be leveraged by banks and credit unions of all sizes to reconnect with customers, sell more products and services, and remain vital to their communities. Read this blog to find out how we are helping our customers make Netflix-like recommendations with collaborative filtering and Q2 SMART. This infographic is a visual representation of our “defense-in-depth” multi-layered security approach. A strong security strategy is vital to protecting account holder data and maintaining trust between your institution and your customers. Numerous ransomware attacks and data breaches occurred in 2017, which proves that multi-layered security is as important as ever. Compliance is always a hot topic. It can be difficult to manage compliance for your institution in a heavily regulated industry. Managing compliance for third-party vendors can be an even harder task. Read this blog for our five suggestions to help your bank or credit union with effective vendor compliance. Our founder Hank Seale talks about how Q2 got started, the importance of staying true to your mission, and how thankful Q2 is for the partnerships we have formed over the years in this video blog. As Hank emphasizes, Q2 is driven to build stronger communities by helping community-focused banks and credit unions thrive in the digital age. Our VP of Product Management Jennifer Dimenna wrote this blog about the intersection of life and technology. As more and more people use smartphones and adopt wearable technology, a great experience on these devices, especially when it comes to finances, is of the utmost importance. 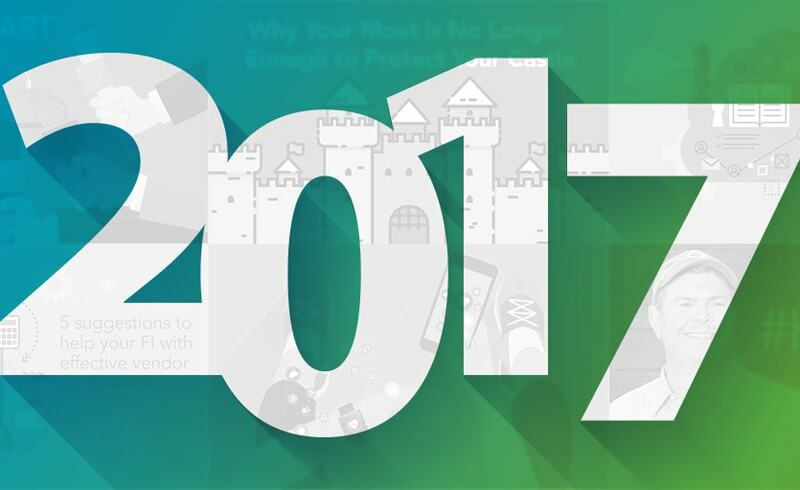 There are other Q2 blogs from 2017 that are just as worthy of being part of the Top Blogs of 2017. We hope you read them, and while you’re doing so, don’t forget to subscribe to our blog for more great content in 2018. Happy New Year from Q2!